Charming honest down to earth Aurora is one other thing: weird! But she still has the same coming of age problems most 12 year olds have. Although her life is beginning to unravel, I loved her struggle, and the ending is perfect. Heartfelt, and full of mother-daughter AND father-daughter love. 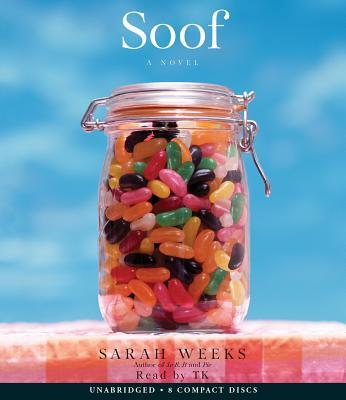 In this stand-alone follow-up to Sarah Weeks's beloved So B. It, a girl who the world might see as weird finds her footing and stands her ground. All her life, Aurora has heard stories about Heidi and all the good luck she brought Aurora's family. Aurora, though, doesn't feel very lucky. The kids at school think she's weird. And she's starting to think her mom thinks she's weird, too. Especially compared to Heidi. On the eve of a visit from Heidi, more bad luck hits Aurora's family. There's a fire in their attic, destroying a good part of their house. And, even worse, Aurora's beloved dog goes missing. Aurora and her family have always believed in soof -- Heidi's mom's word for love. But sometimes even when soof is right there in front of you, you still need to find it -- and that's exactly what Aurora is going to do. Sarah Weeks was born and raised in the United States. She is the author of numerous award-winning novels, including Save Me a Seat with Gita Varadarajan, Honey, Pie, So B. It, Oggie Cooder, and Oggie Cooder: Party Animal. She lives in New York and teaches in the MFA program at the New School in New York City. She can be found on the web at sarahweeks.com.